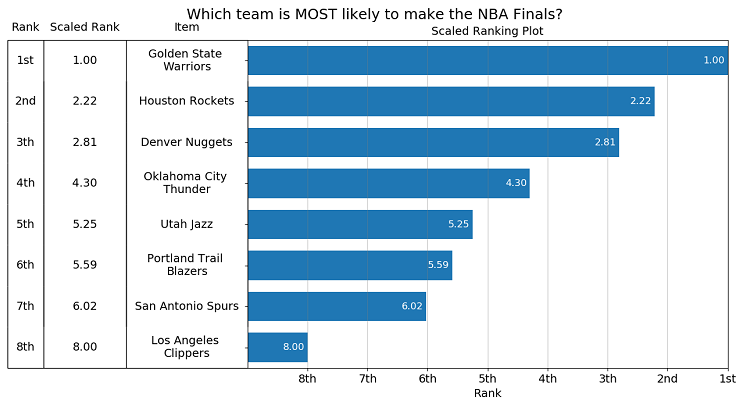 Every week, researchers at Unanimous AI gather a swarm of NBA fans and enthusiasts to forecast the latest matchups. The NBA Swarm uses a new technology called Swarm AI to combine their wisdom, intuition, and experience into an optimized forecast that often outperforms even the best experts on record. You can see the NBA Swarm’s latest forecast below, or see a long-term study of its results HERE. For the NBA playoffs, Unanimous AI put together two smaller groups from our regular poll of NBA Swarm participants, a community who collectively beat Vegas handily in the aforementioned study. 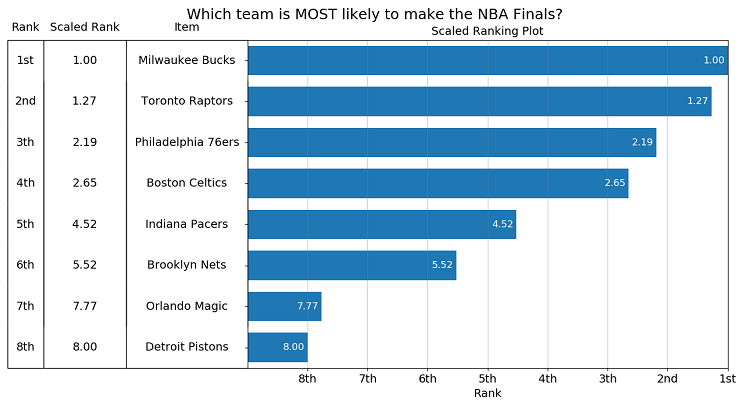 The groups were both asked the same set of questions, first creating a ranked order of likelihood in each conference to make the NBA Finals. With those picks in hand, the Swarm AI system then predicted which of their three highest-ranked teams in each conference would be the one to hoist the trophy at the end of the postseason tournament. The Unanimous AI research team then combined the results of both groups into scaled ranking graphs. Every week, Unanimous AI publishes predictions made by its Swarm AI platform. Want to have those picks delivered to your inbox? The news, information, opinion, and recommendations on this website are for education and entertainment only. This information is not intended to violate any local, state, or federal laws, and all persons using this website are solely responsible for complying with the laws of the jurisdictions in which they reside. Unanimous A.I. is not responsible for the accuracy of any predictions made on this website, and does not recommend using the information on this site for wagering. Unanimous A.I. does not intend to encourage or condone gambling in jurisdictions where it is prohibited or by persons who are under 18 years of age.